Hardwood flooring is a detailed topic. You could talk at length about wood type, stain color, pattern orientation, performance etc. when discussing wood floors. Similarly, a worthwhile consideration is the type of wood that you choose based on the climate of your region. You have to keep in mind that certain wood types are more susceptible to moisture, humidity, gapping etc. than others. When it comes to wood flooring in Colorado, you should be happy that you have several options to choose from. That’s because Colorado has one of the best climates among other states in the US. The sun shines 300 days every year, the humidity is around 33% on average (on average this is pretty dry), and the 6,800 ft elevation gift Colorado with mild seasons. It is clear from these climate figures that almost any wood is suitable for hardwood flooring in Colorado. No other domestic hardwood offers the beauty and status of walnut flooring. Like cherry, walnut has for centuries been the standard for eloquence and beauty. Its unique natural color and silky grain give it smooth appearance. The heartwood of walnut is a chocolate brown with a slight reddish tone and the sapwood can be almost white, though most walnut only comes in steamed walnut which causes the color to be more consistant. One of the most common grades available for walnut is the Character grade which will contain some sap wood and large, black knots. Walnut can be used in almost any design setting from contemporary to rustic. North American Red Oak Flooring is the most common type of hardwood flooring used and has been for centuries. 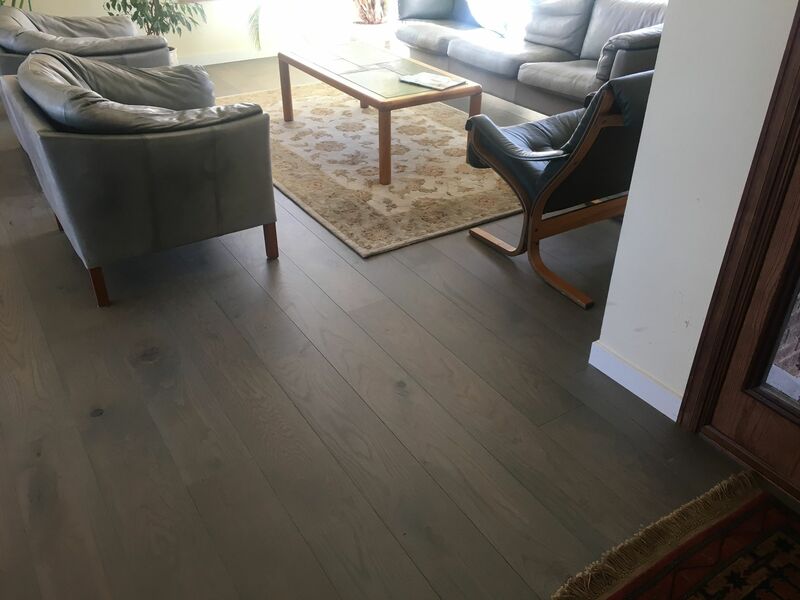 Red Oak is one of the most versatile hardwood flooring options available and will compliment almost any design style especially given its ability to take most stains evenly. Red Oak generally has a uniform color of very light blonde with a light reddish tone to it. There isn’t much difference between the sapwood and heartwood of red oak hardwood compared to a hardwood like hickory. Like its American counterpart, Brazilian cherry hardwoods offer rich colors that can warm up large rooms exposed to lots of natural light. Typically a alot more durable than American cherry, exotic Brazilian cherry flooring is a good option for high traffic areas of the home exposed to potential dents and scratches. Brazilian cherry is among the more affordable hardwoods on the market and comes in an array of rich, red colors. Brazilian Cherry like the American cherry is photosensitive and will change color over time. It is also the hardest wood flooring that we provide and being so, don’t recommend staining it as it looks beautiful in it’s natural form. Most people are not sure of the difference between red oak and white oak and many just think of them together as ‘oak hardwood’ but there is a distinct difference. White oak heartwood has a more tan or brown color often times with a slight olive coloring. White oak stains very well and is used by most hardwood flooring manufacturers for their stained hardwood products. In terms of hardness, white oak is slightly harder than red oak. White oak is more commonly offered in Quarter or Rift Sawn (vertical grain cut) than red oak but is also available in plain sawn (flat or cathedral grain). Many people prefer the olive brown color of white oak over that of red oak especially for oak floors that will be finished natural. Hickory hardwood flooring is one of the strongest and most durable options when looking at domestic wood flooring options. The natural beauty and character of hickory hardwood is highly sought after by designers and homeowners alike. Hickory wood flooring comes in various grades, of which the most commom is 2nd & better, a mix of select, #1 and character grade wood and will range in color from a light blonde (sapwood) to a reddish brown (heartwood). The next most popular grade, is the Character grade. This grade allows for the natural beauty of the hickory to show. It will contain a full range of sap wood and heart wood along with dark brown; almost black; mineral streaks and knots. Hickory hardwood is generally thought of as a rustic looking wood species; however hickory can be stained (only to medium colors as there is a chance of blotching due to the density) to give it more versatility with other design styles. Hickory is also available in higher grades (Know as select grade) which will have a more uniform color (less dark heartwood), and fewer or no character marks like mineral streaks and knots. Hickory is one of the hardest domestic wood species available and offers excellent impact resistance making it a great choice, especially for high traffic homes. When you are looking for the best material for wood flooring in Colorado, be sure to consider the durability and toughness among other factors too. Do not fall, just for the aesthetics. There are plenty variables to consider when choosing, installing, sanding, staining and finishing any wood floor. Make sure you choose a wood flooring specialist, like Floor Crafters Hardwood flooring for your next project.